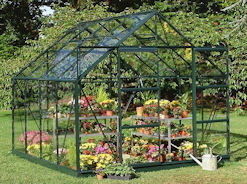 Glass greenhouses have been desired for their beautiful looks for years. 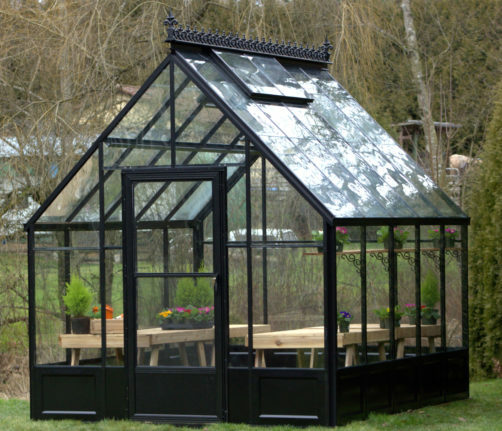 With a glass greenhouse, you can see clearly what is inside (or outside) of your greenhouse. Today, all of the glass we use in our greenhouses is tempered glass, giving you added safety and strength. Our Acadian Glass Greenhouses offer several options, including a Victorian Ridge Decoration, and 3 different styles of roofs. These are available in a white, brown or green frame. One of our limited edition Acadian Glass Greenhouses has a black frame. If you are looking for a greenhouse for your backyard, you owe it to yourself to check out the timeless elegance of our glass greenhouses. The Halls Magnum Glass Greenhouse has a heavy mill finish cast aluminum frame. It comes with a double sliding door. It is glazed with all single tempered glass. 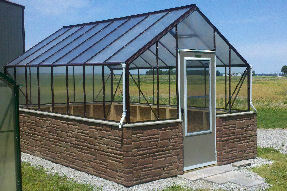 The Acadian Glass Greenhouse is available in sizes from 8 x 12 to 12 x 16. We have several options with this greenhouse. We can do a door drop to accomodate an owner supplied kneewall, or we can add a decorative trim to the peak of the roof. Also, this greenhouse is available with 3 different roof styles, for 3 completely different looks. We do not want to mislead you. This is not a glass greenhouse. It is all polycarbonate. But, we have listed it on this page, as many people are looking for the clarity of glass, with the durability of polycarbonate. 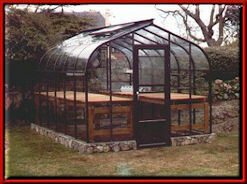 The Acadian Glass Greenhouse is available in sizes from 8 x 12 to 16 x 41. 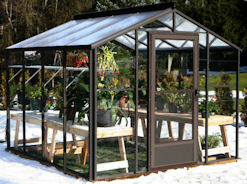 We have several options with this greenhouse. We can do a door drop to accomodate an owner supplied kneewall, or we can add a decorative trim to the peak of the roof. 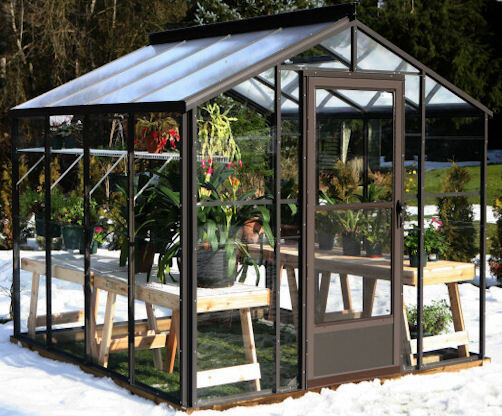 This greenhouse is all tempered glass, even including the curve.